Mince garlic and roughly chop scallions. Peel and mince ginger. Chop pork into bite-sized cubes. Cut and separate leaves of bok choy. Fill wok one-third of the way with water and poach pork belly for approx. 5 – 7 min. in boiling water. Strain and set aside in a small bowl. Discard water. Heat oil over medium-high heat. Add ginger, garlic, and scallions to oil and sauté for approx. 1 min. Add star anise, cinnamon, black cardamom, and bay leaf. Then, return pork to wok and fry along with aromatics for approx. 1 – 2 min. Mix miso paste with water and add to wok. Peel hard boiled egg and add to wok. Cook for approx. 1 hour. Season with dark soy sauce and salt, pepper, and sugar to taste. Remove star anise, cinnamon, black cardamom, and bay leaf before serving. Bring another wok or saucepan filled with some water to a boil, add some oil, and cook bok choy for approx. 10 – 20 sec, or until softened slightly and bright green. Remove bok choy from wok and set aside. 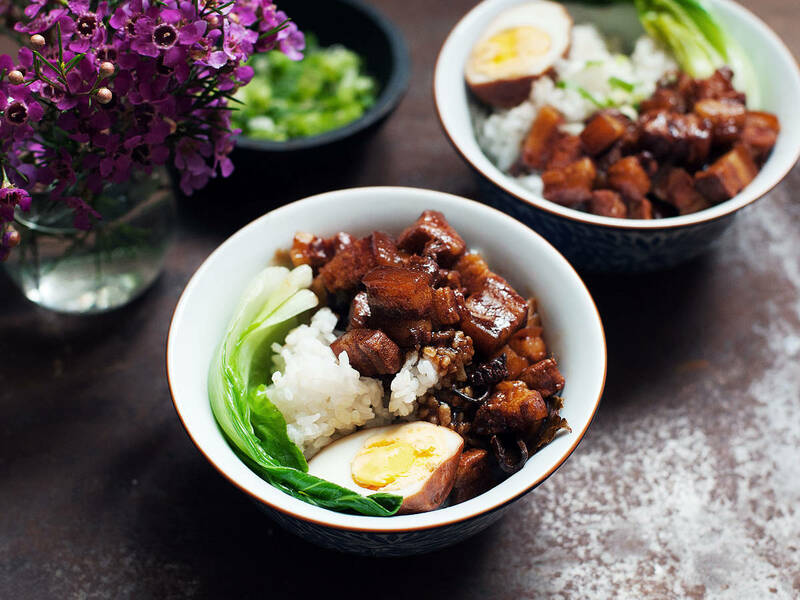 Halve egg, then arrange pork, bok choy, and egg halves in serving bowls over a bed of rice. Enjoy!